I decided to start the year wearing something that is not my usual pair of jeans. My face looks funneh. LOL. If you asked me last year if I would wear a skirt even though I wasn’t required to, I would’ve said “ABSOLUTELY NOT.” With conviction. True, I’ve worn a dress once last year just for fun (because it was a really nice dress, wasn’t it?) But I did keep insisting that I still wouldn’t wear a skirt if I didn’t have to. But, after a year of blogging about clothes and other girliness, I told myself that maybe it was time that I actually broke my no-skirts-unless-absolutely-necessary rule. That day, my friends, is NOT this day. Because that, my friends, is NOT a skirt. HA! Yeah, its actually a skort. My brother once told me that guys hated skorts. I don’t really get why. But there it is: me in my skort, one that I’ve had for years, but almost rarely wore outside. I wore it during my graduation outing with my family, and posted the photo online. Monumental, that day. I think that was the first time the innerwebz saw my knees. Hrhrhr. Okay, I’m going in circles now. MY POINT IS THIS: I started this year in a skort because I have decided that, yes, perhaps I might wear skirts and dresses this year. I’m still not sure yet, but I do blame this blog for slowly, but (apparently, oh so surely) tweaking my personal preferences. SO. 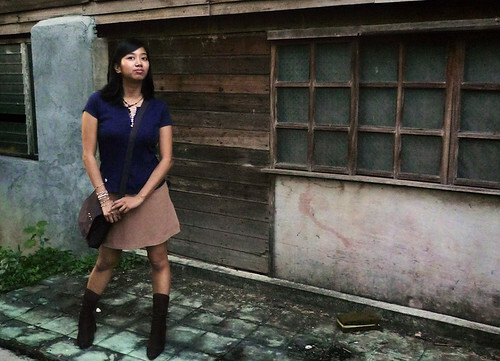 My January 1, 2011 outfit: Blue shirt from I-can’t-remember-where. Brown satchel, a Metrobank freebie. My skort from I-can’t-remember-where-either. A 10-year-old heart necklace from Davao (I think). Bracelets. Boots. Title from “Wait It Out”, Imogen Heap.